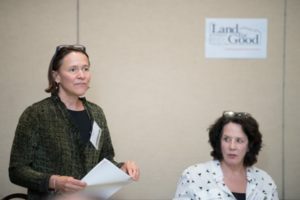 Karen Stettler, Land Stewardship Project, moderated the first discussion on beginning farmers’ and ranchers’ land access needs. Discussion led by panelists Mary Ahearn, USDA/ Economic Research Service (retired); Holly Rippon- Butler, National Young Farmers Coalition; and Tim Biello, American Farmland Trust. Jerry Cosgrove moderated workshop on tools, methods and innovations in transfer planning assistance. Seekers and Land Access examined needs, financing, the role of easements, ownership and the intricacies of leasing. This track focused on the issues related to seeking a farm or ranch (whether to purchase or lease) and to improve producers’ land tenure situation. Sessions addressed questions such as who are farm/ranch seekers, what are their land access challenges and what tools exist or are needed to assist them. Panelists described challenges associated with specific seeker demographics and challenges, from finding land to financing a farm purchase. 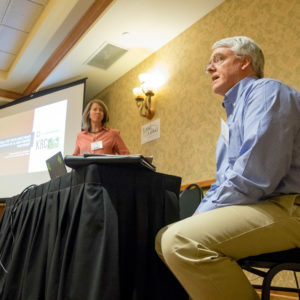 Tools such as conservation easements were discussed, as were land financing and leasing strategies. The roundtable discussion explored the practical and policy tensions between land ownership and tenancy. What are the characteristics and needs of beginning farmers and ranchers (stage of farming, region, etc.)? What do we need to know? We discussed the implications for programs and policies to address their circumstances and challenges around land access. Discussants set a framework for the relationship between access to public and private capital and access to land, looking at the issues, options and policies around financing land acquisition. Easements play an important role in land affordability, availability and agricultural practices. 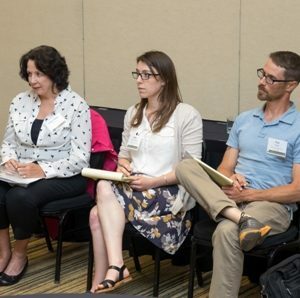 Presenters shared their best and emerging practices around ag easements with a focus on land access and transfer, including more broadly the intersection of tenure and conservation. 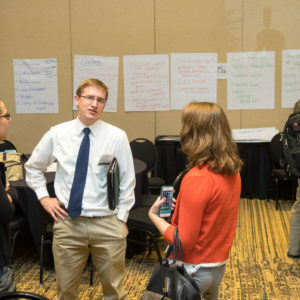 What are our goals and priorities for land access and tenure in the U.S.? What factors need to be considered? This roundtable used the constructive tensions around land tenure toward a useful framework for our collective work. Presenters dove into perspectives on leasing—the types and suitability of leases, and their legal and policy dimensions. We addressed roles and skills for TA providers to assist with good farm lease agreements. 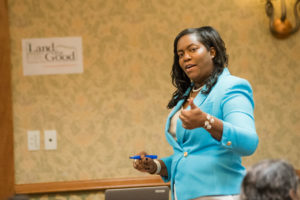 Improve farm link programs and networks by being clearer about what service(s) they provide (e.g., listing, linking, matching, advising, educating), and to move away from “matches” as the only outcome. Virginia Certified Farm Seekers Program assists farm seekers to demonstrate their vision and credentials to landowners, thereby also providing landowners with quality farm seekers who are serious about farming and have established goals and plans. Farm bus tours take seekers to visit farm properties: Columbia Land Conservancy. Use ag mediation programs to facilitate tenure transactions. Enable Farm Service Agency-certified mediation programs to work on land access negotiations. Land access service providers to support seekers and facilitate transactions. For example: Land For Good consulting; Renewing the Countryside training Land Access Navigators (BFRDP project, 2017-2020); American Farmland Trust’s BFRDP EET project, Land Access Trainers project. Use and encourage ground leases. See Equity Trust. Peconic Land Trust’s Farms for the Future Initiative leases land to beginning and established farmers. Promote share-leasing as a way for landowners and tenants to share risk. Employ a rolling lease term for greater tenant security. Include a probationary period as a transition from short-term to longer-term leases. Encourage lease-to-own (right of first refusal and option to purchase) as an affordable path to ownership. Online lease templates and tools. See for example, California Farm Link lease template, Land For Good’s Build-a-Lease (pending). Southern Appalachian Highlands Conservancy offers affordable leases on its incubator farm on 103 acres of donated land. SAHC partners with Western NC Farmlink on Farm Pathways: Access to Land, Livelihood, and Learning, a training and land access program for new and aspiring farmers. Role of crop insurance in relation to equity a lender will require. Equity investments in BFRs through a separate pool of capital (Farm Credit East’s FarmStart program). Community involvement: One Farm at a Time, for example, raises community contributions toward purchase of an easement to help transfer a small California farm to the next operator. Include an Option to Purchase at Agricultural Value (OPAV) (e.g., Vermont Housing and Conservation Board (VT) and an affirmative farming clause in conservation easements (e.g., Marin Agricultural Land Trust (CA)). Working buffers in which a farmer leases riparian areas (Sustainable Iowa Land Trust (SILT)). Add farming to federal public service loan forgiveness program to better position farmers and ranchers to finance a land acquisition. Offer tax credits to landowners who lease or sell land to beginning farmers such as those in Iowa, Nebraska, and Minnesota. Ensure adequate future funding for the federal Agricultural Conservation Easement Program (ACEP) with a set funding floor for the Agricultural Land Easement (ALE) component. Raise the Farm Services Agency (FSA) Direct Farm Ownership loan cap. Use State bonding authority to underwrite loans to farmers at below market rates.